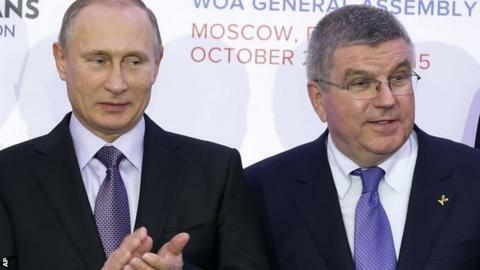 International Olympic Committee chief Thomas Bach believes Russia will resolve its doping issues and field athletes at next year's Rio Games. Russia was provisionally suspended from world athletics after an independent World Anti-Doping Agency (Wada) report alleged "state-sponsored doping". Bach met with his Russian Olympic Committee counterpart Alexander Zhukov to discuss the report. He said he was "confident" in the measures put forward by the ROC. Council members of the International Association of Athletics Federations (IAAF) on Friday voted 22-1 in favour of Russia being banned. As it stands, Russian athletes may not enter international competitions, including the World Athletic Series and Rio Olympics, which begin on 5 August next year. "We are confident that the initiatives being proposed by the ROC, with the responsible international organisations - Wada and the IAAF - will ensure compliance as soon as possible in order to provide participation of the clean Russian athletes at the Olympic Games," said IOC president Bach. The ROC insisted all athletes, officials and coaches implicated in doping will be held responsible and punished in accordance with international anti-doping regulations. "The Russian Olympic Committee is determined that clean athletes should compete in the Olympic Games in Rio de Janeiro," said Zhukov. "Anyone found guilty of using illegal drugs or anyone who facilitated or was complicit in their use must be punished." co-ordinate all efforts in Russia to address the issues mentioned in the independent commission report with a view to make Russia's anti-doping agency, the anti-doping laboratory in Moscow and the national athletics federation compliant with the Wada code and all other international anti-doping regulations as soon as possible. initiate the renewal and reform of the national athletics federation. make the anti-doping system independent from sports organisations and to request that Wada take over this function as soon as possible.